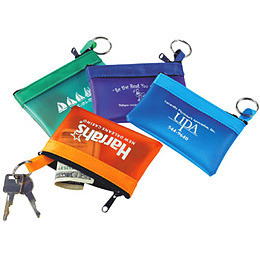 Handy sized frosted vinyl printed key pouch with bright solid nylon band and tempered spring-steel split ring attached. Keyring strap attaches inside the pouch, keeping keys secure. This personalised key pouch is also great for coins, promo kits, id cards and more. Nylon zipper.